Holding a chair open for Ahmed Naji. 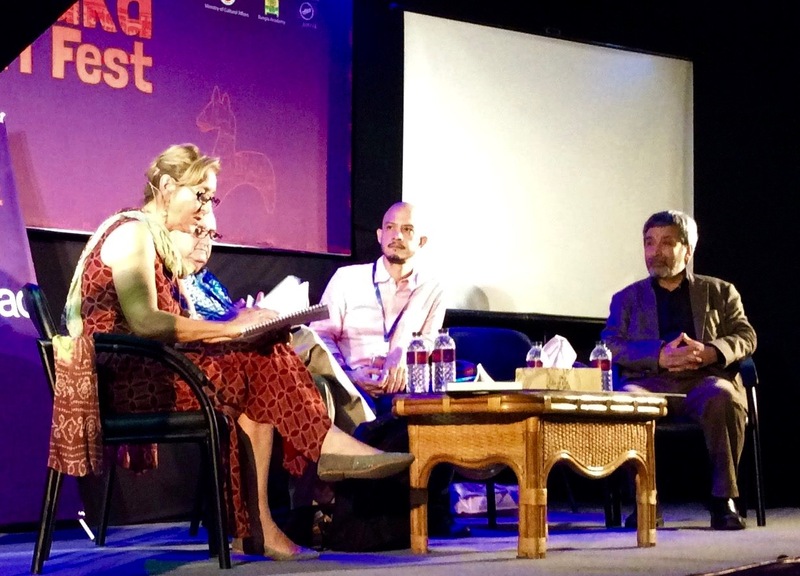 Last year, the fest featured Palestinian poet and novelist Ghassan Zaqtan, along with poet-translator Fady Joudah. Zaqtan and Joudah won Canada’s prestigious Griffin Poetry Prize, and Zaqtan was listed for the Neustadt Prize. But somehow his 2016 novella Describing the Past, gorgeously translated by Samuel Wilder, largely escaped Anglophone attention. Too bad it wasn’t on sale at Dhaka LitFest: Many visiting writers this year described, with surprise, how they had sold every copy of their books on sale at the festival. This year, the festival featured Egyptian novelist Nael Eltoukhy, author of Women of Karantina (translated by Robin Moger) among other novels. He was joined by myself, ArabLit editor M. Lynx Qualey, and also by Max Rodenbeck, author of Cairo: The City Victorious, who now works for the Economist in New Delhi. The two Arab and Arabic-focused events were both packed with festival-goers, and for the most part they asked excellent, pointed questions. Several crowded up after, asking for book recommendations. At an event about “World Literature: Hidden Realities,” a woman in the audience asked about how we could get more translation moving between non-European languages, such as between Bangla and Arabic. Indian novelist Anjum Hasan, also on the panel, suggested that this might be difficult. But she asked why India — which has a substantial English-language publishing industry — couldn’t start by bringing world literatures to English and publishing them in India, rather than waiting for London or New York City to decide what to translate from Chinese, Arabic, or Indonesian. But the most poignant moment for Arabic literature at the Fest was when a chair was left open for Egyptian novelist Ahmed Naji at the event about censorship, “Words Under Siege,” and PEN International’s Romana Cacchioli (pictured above) read Lebanese novelist Hanan al-Shaykh’s open letter to Naji. Not every Bangladeshi author is a fan of the fest, of course, and there were complaints that it was a “fig leaf for a one-party state.” Some commenters on twitter re-iterated the 2013 critique that it was “The Potemkin Village of the Secular Liberal Elite in Bangladesh.” Certainly, the festival was a secular event, and certainly literary festivals are generally elite, but having V.S. Naipaul headline the festival was a strong statement. At the panel “After the Arab Spring,” one audience-member asked about whether there were religious novelists in Arabic and how they were received. What came to mind for me was Amr Khaled’s Rafi Barakat, which was generally trashed in literary spheres; Eltoukhy also suggested that religious-themed literature was largely marginalized and that it was probably, generally speaking, not very good. Dhaka is still a young festival, existing in an exceedingly difficult environment. Hopefully its relationship with Arabic can continue, and thrive, and lead to new connections.